This time, I did something that I wanted to do for so long, but missed the chance: Go up to the 88th floor of Eureka Tower, the highest skyscraper of Melbourne, and the second highest of Australia. Having discovered myself a fear of heights recently, I admit I was a bit nervous to go that high, for the first time in my life! Eureka Tower is located in Southbank, where you can take a stroll along the Yarra River while gazing at skyscrapers in CBD. Both as a tourist and local attraction, this part of Melbourne has a lot of good restaurants, Crown Casino, a luxury casino and is the place of many street artists and vendors. You can also choose of one of the many cruises available on Yarra River and set from here. But my goal was set, I was going up to the 88th floor! First things first, paying for the ticket. It costs 20 AUD to go up, and an extra 15 AUD for EDGE Experience, a 15 minutes stay in a glass cube on top of the city! I chose them both as this was my first time and I wanted to avenge my fear of heights! Good to know: You’re not allowed to hold your camera or phone while going in the glass cube, but instead they make a picture of you inside and later they sell for 15 AUD, a ripoff you ask me! After you pay for your tickets, you are being offered a device which will vibrate when it’s time to have the EDGE Experience. I arrived there 30 minutes before sunset because we all know that’s the best time to take pictures! Also, the city was a bit hazy during the day which doesn’t really help for a good view from above. Going up in the elevator you can feel your ears getting clogged so you know you’re going high fast! Precisely: In 38 seconds you’re up at the 88th floor! Eureka Skydeck is the highest observation deck in half the world so that makes it pretty impressive! With 91 levels the huge amount of stairs is not a wonder! 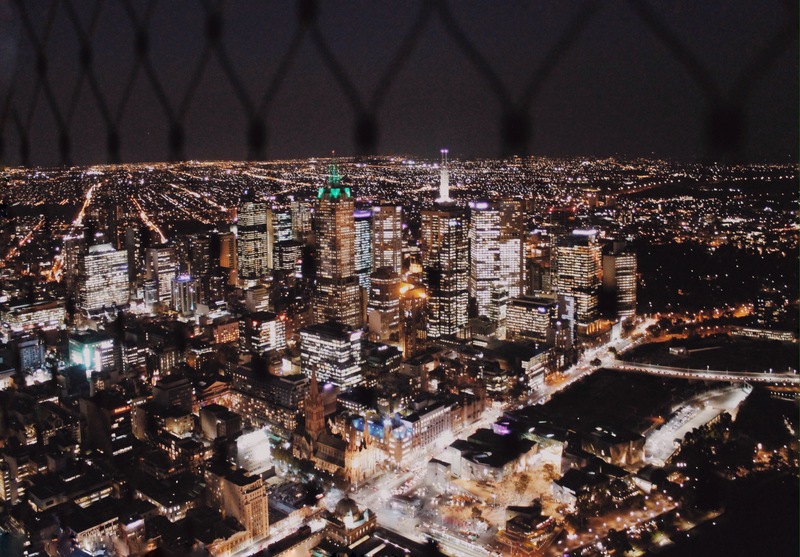 There are 3,680 stairs in Eureka Tower and every year there’s even a competition for scaling 1642 of them! Eureka Tower may be very impressive in its structure and facilities. But one thing they don’t advertise when you get the tickets is that you’ll fall in love irremediably with Melbourne. Once you’re up there a feeling of wander takes over you thinking that you’re really here! In the World’s most livable city! I finished my night enjoying a glass of Australian Wine at Transit Rooftop Bar in Federation Square, that’s the center of Melbourne. It seemed proper to end an evening of spectacular views just with another one. I hope you enjoyed these views at least half of what I did guys! Don’t forget to subscribe if you liked my stories cause there are new ones coming soon! We’ll visit Sydney this weekend, and next week I’m back in Romania for Easter so stay tuned!